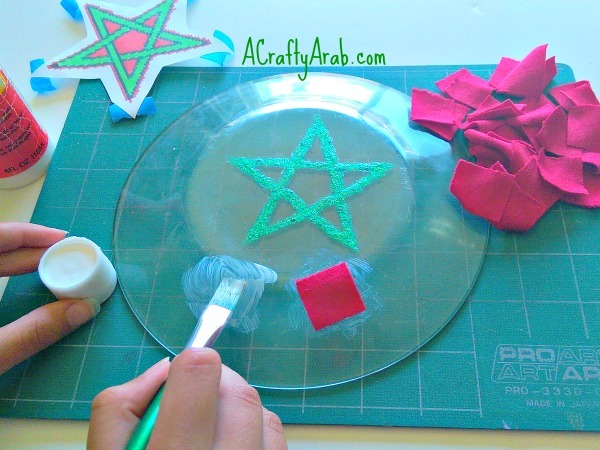 I am currently trying to do a craft from each of the Arab League countries and today seemed like a good day to add Morocco! Morocco (Arabic: المَغرِب‎) is a country located in North Africa, that has a mountainous interior, large tracts of desert and beautiful beaches along the Atlantic Ocean to the west and Mediterranean Sea to the north. Its capital is Rabat, but the major airport is located in the largest city: Casablanca. Moroccan culture is a blend of Arab, indigenous Berber, Sub-Saharan African, and European influences. 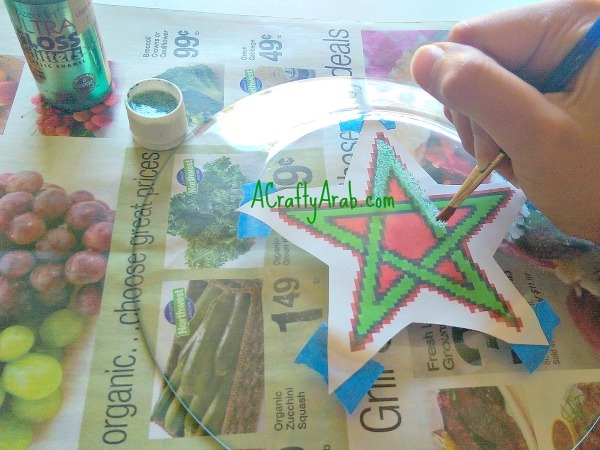 The Morocco flag comprises of a red field with a black-bordered green pentagram. The red background on the Moroccan flag represents hardiness, bravery, strength and valour, while the green represents love, joy, wisdom, peace and hope, it also represents the color of Islam, whereas the five-pointed star represents the five pillars of Islam. I had seen these glass plates turned into a personalized candy dish with an initial letter and thought wouldn’t it be great to try it as a Morocco flag instead. Take your Pentagram print out and tape it to the front part of the dish. Use your brush to apply a minimum of 3 coats of the green enamel paint on the glass. It’s best to dap when painting with glitter. With the scissors, but your fabric into 1 inch squares. 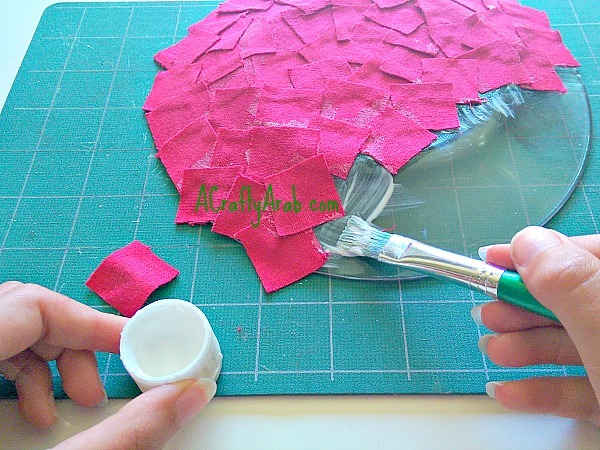 Use Mod Podge on a small area of your plate and then add a fabric square. 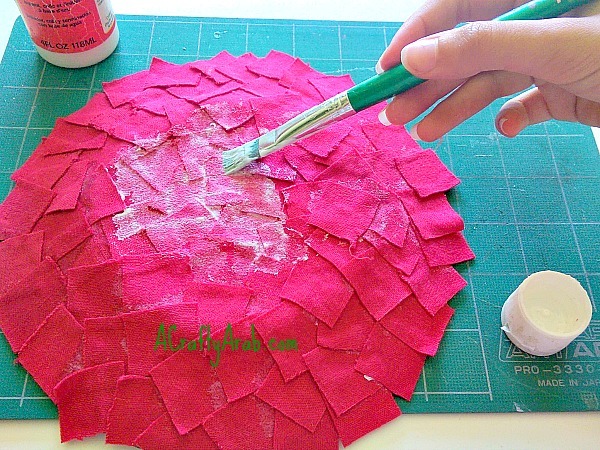 Continue around your entire plate, putting Mod Podge down and then one fabric square. Work slowly to make sure you overlap and don’t leave any gaps. Once your plate is covered in squares, add another generous layer of Mod Podge on top to seal the fabric. Use the scissors to cut around the edges. You are done! Do not run your glass plate in a dishwasher, or use water on it. It’s best for sealed foods and it if gets dirty, simply wipe it down. 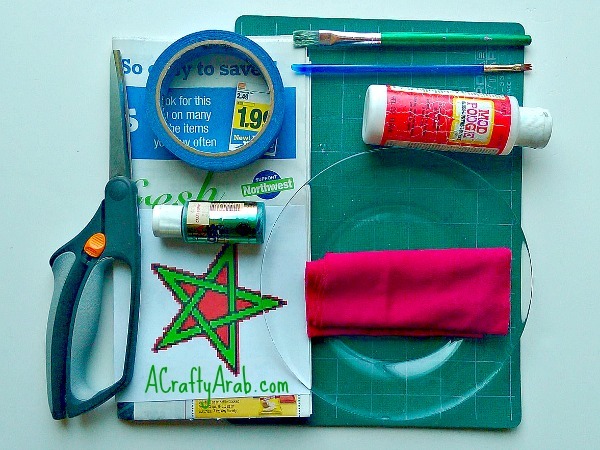 To enjoy more Arab world tutorials, please visit A Crafty Arab on Pinterest.